Tacoma’s Dukesbay Theater states, as its mission, “to promote independent theater in Tacoma and to give voice to artists of all ethnicities.” It is the function that sets this small operation apart from her larger sister theaters in the South Sound. A worthier task they could not have, and an admirable and serious goal it is. That said, Dukesbay is anything but severe and dour. Co-founders Aya Hashaguchi and Randy Clark love to bring the fun to their stage. Case in point, the seventh iteration of their popular Java Tacoma series. 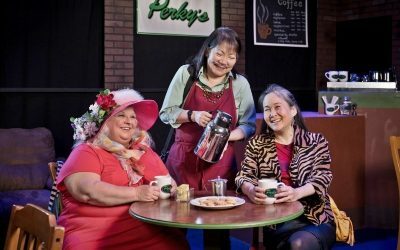 Penned by Ms. Hashaguchi, this one is titled “Java Tacoma: Covfefe is for Closers.” Full of biting local color, and gentle political humor it is a show for anyone who likes to laugh. 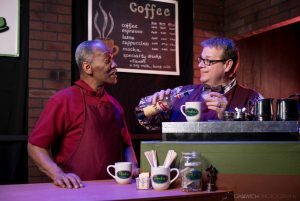 “Java Tacoma is a local treasure.” That’s what one patron of the arts said when Opening Night was announced. Truly it is and the shows get more off the hook with each episode. That isn’t a criticism! Rather, it is a reason for old fans of the series to come back and new fans to buy a ticket. 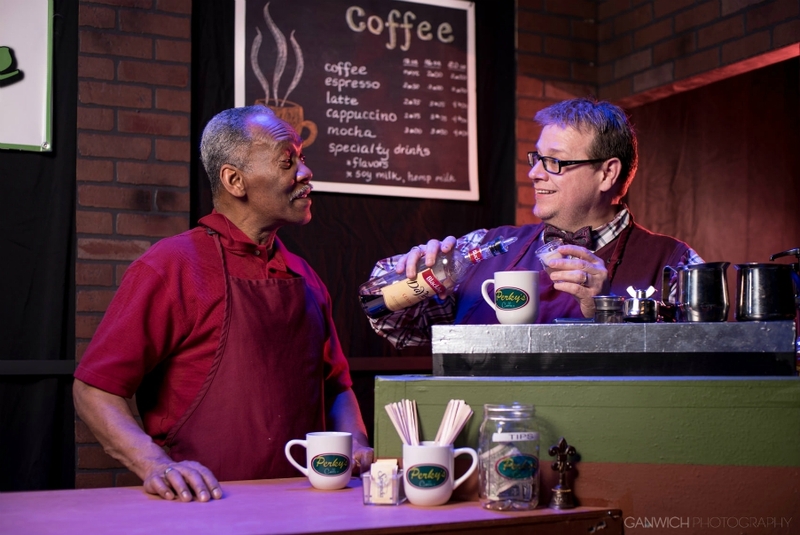 In this episode, Perky’s Coffee Shop struggles against local property gentrification. Their building is for sale and Perky’s, along with neighboring apparel shop “Hollywear” may not be able to survive. There is one piece of hope, however. Building owner Peter LeGrand is willing to sell to a current resident. What does he want for the place and can one of the owners cobble together enough cash? That’s the setup for this episode. From there the plot goes wildly askew, song and dance numbers abound (this is the most musical of the Java Tacomas, at least in the last four years), and Perky’s is saved…at least for now. Next year, or the year after, a new crisis will emerge. That’s sitcom world, and Java Tacoma rests happily in its bosom. Director Randy Clark is blessed with a lot of talent for his show. As Linda Gonzales, Aya Hashaguchi is the anchor. However, Linda Gonzales is a bit wackier in this show than in others. She sends up Asian stereotypes one after the other. Indeed, if the audience didn’t know before that “Oriental” isn’t an acceptable descriptor of “Asian” they will before this night is over. As Linda’s husband Bert, Malcolm J. West wears his role like a comfortable suit, performing admirably. Bert’s consternation at his new employee’s “whole new you” is hilarious. Bert needs help running the shop, but what’s up with the new guy? Mr. West and Ms. Hashaguchi are not husband and wife. However, they play a married couple superbly. The roles of Jeri Rockwell and Kate Cunningham are interpreted by Susan Kaeka and Betzy Miller, respectively. They own “Hollywear Costume Shop” but for entrepreneurs spend an awful lot of time at Perky’s. Ms. Rockwell and Ms. Cunningham play off each other like the seasoned pros they are. They both do a fine job. Kate Cunningham bobbled a few lines Opening Night, but she will have that under control in subsequent shows. Jeffery Weaver is a local propmaster and a valuable part of the theater scene at several local shops. Lately, though, Jeff is spending more time on stage. That’s only right because his flair for comedy is evident in every outing. As Darren the barista Jeff is fine. As a Veronica Lake lookalike, Jeffery Weaver is divine! He sweeps through the cafe, tossing his blonde mane and ready for his closeup. Jen Aylsworth and Roger Iverson play Marian and Peter LeGrand. Ms. Aylsworth is a veteran of local theater but makes her first appearance in a Java Tacoma. Her Marian is empathetic and well-played. Mr. Iverson is bombastic and the subject of the only overtly political piece in the show. He’s supposed to be coiffed into the originator of the word “Covfefe.” He looked more like a strawberry blonde James Brown. Either way, he handles his part well. Oh, it is a little icky when he…, well, we’ll leave it at that. While Opening Night is rarely perfect, one key off-stage aspect of this show was exactly that. Sound design is by Niclas Olson. If he was upstairs in the booth, then his work was splendid! There are some tricky sound cues in “Java Tacoma: Covfefe is for Closers.” The sound engineer deserves all of the praise for making it happen. That said, this is a show worth seeing, put on by a company that deserves full houses for every performance! One doesn’t need a passion for theater diversity to see this play, but why isn’t that a worthy goal. One doesn’t have to root for small theaters to see this show, but that only makes this show more delicious. “Java Tacoma,” iteration seven is a hit. Make plans to be one of the 40 or so patrons for the next show. It’s a small theater. Make plans now and arrive early…before someone takes the last caramel cookie. Java Tacoma: Covfefe is for Closers, by Aya Hashaguchi. Dukesbay Theater, 508 S. 6th Ave, Tacoma, WA 98402. Friday-Saturday 7:30, Sunday 2 pm, until March 18. Tickets javatacoma7.brownpapertickets.com. Info: dukesbay.org or (253) 350-7680.